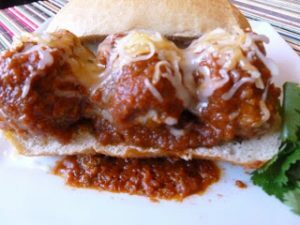 Mexican meatball subs – albondigas – are the Tex-Mex south of the border version of America’s popular Italian meatball sub. The secret ingredient is to mix Larry’s All Natural Ranchero Taco & Enchilada Sauce into the meat and then simmer the meatballs in more sauce. Top with a little bit of grated cheese and you have a savory sandwich packed with flavor. Healthy and all-natural, too. Place the meatloaf mix, bread crumbs, ranchero sauce, beaten egg, salt and pepper in a mixing bowl. Blend the ingredients and then make 12 meatballs. Place the vegetable oil in a large skillet and fry the meatballs over medium heat until browned and cooked through, about 10 minutes. Pour the remaining Larry's All Natural Ranchero Sauce over the meatballs, cover and simmer for ten minutes. Place two to three meatballs on a sub roll, spoon on a little more sauce, sprinkle with the cheese and serve.